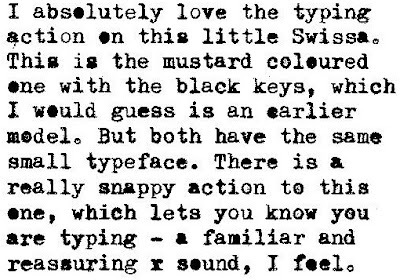 It seems such a pity then, that Bill’s one typewriter design, for what started life as the Swiss Piccola portable, should appear – in most of its incarnations – to be so bland. 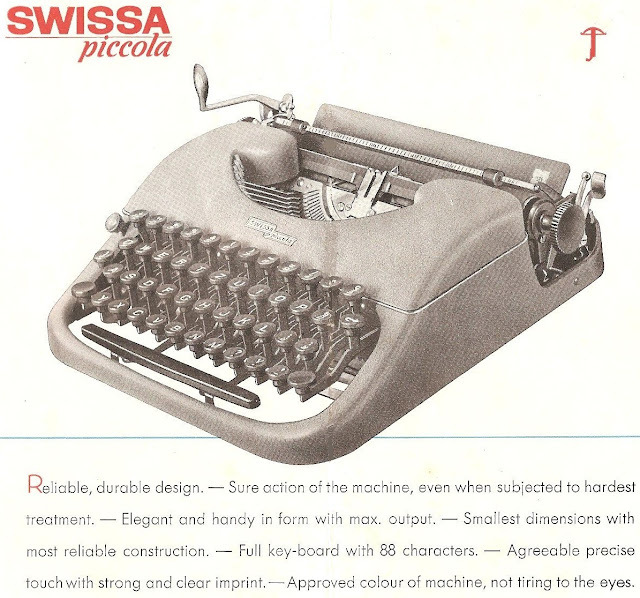 The Piccola brochure says, “Approved colour of machine [grey], not tiring to the eyes”. What a weak claim! Clearly needed, instead, is the sting of mustard, or the soothing feel of pistachio. Grey not tiring? It puts one to sleep with its boredom! 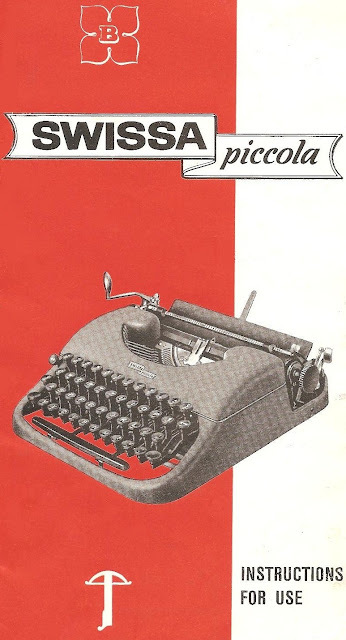 Apart from the Swissa Piccola itself, the Bill typewriter was also made in Britain as the Oliver, in France as the Japy, in Spain as the Patria and the Amaya, and in Germany as the Voss Privat. 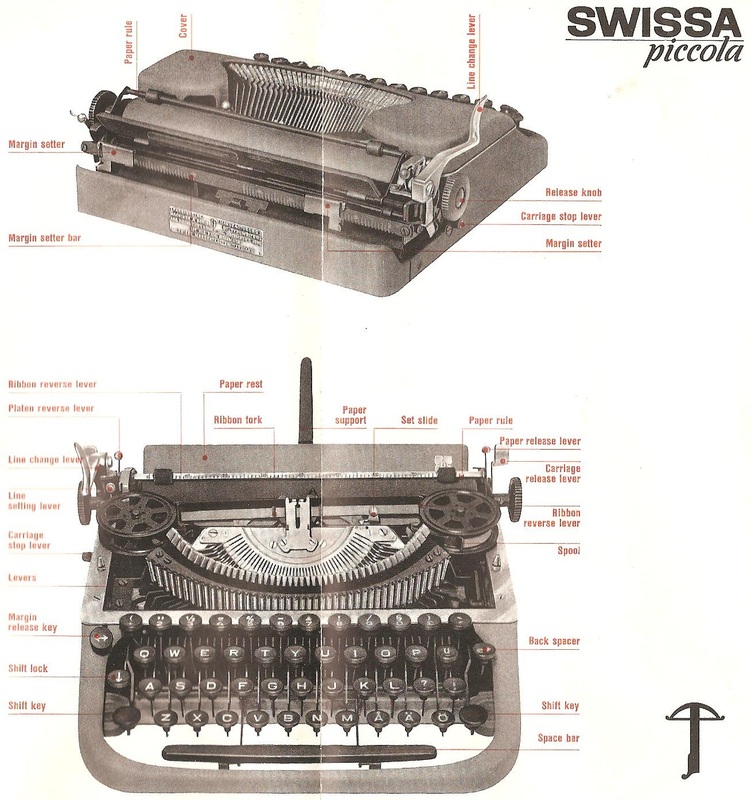 The Swissa Piccola and the Oliver appear predominately in a dull, lifeless grey colour – what was it about the Swiss and the British with their grey paint on either side of World War II? 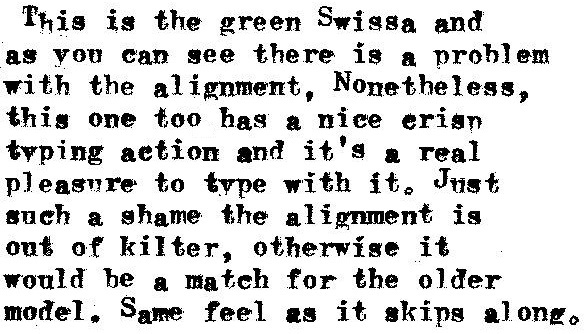 At least another Swiss company, Hermes, saw the light in the early 1950s and started producing typewriters in a more pleasing “hospital green”. The Oliver, Japy and Amaya all began to appear with a metallic blue ribbon spool cover, but invariably a grey base. Easily the most appealing to the eye is the Voss, with a rich cream top and blue bottom. Less common variations from the various brands can be seen in a comprehensive study of the Patria family in the March 2010 ETCetera (No 89). 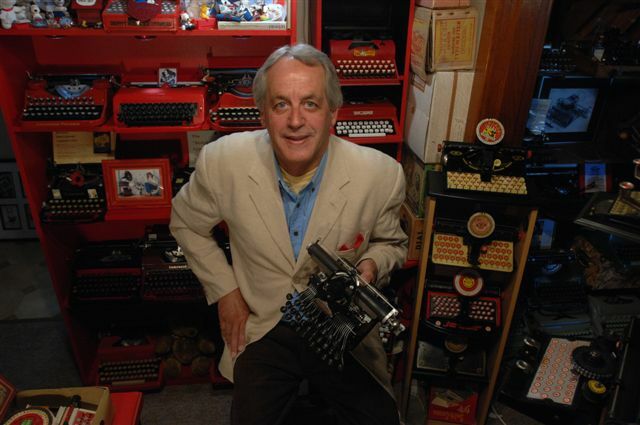 Max Bill’s approach to the design of everyday items such as typewriters was expressed in his quotation: "The difference between the design problems which have to be solved every day and works of painting and sculpture is merely one of degree, not one of principle." I’ve elected to ignore principles, to do some painting and thus present something to honour Max Bill, by giving my two Swissa Piccolas a fresh complexion. Bill's design philosophy was a flawless blend of form and content, “a true moment of clarity”. My Swissa Piccolas were screaming out to be dragged from the drabness of grey, to be given that clarity. From this we gather the company was founded by August Birchmeier in Murgenthal in Switzerland in 1908. Birchmeier died in 1922 and his widow took over the running of the organisation. Then in 1935 the Birchmeiers’ sons gained control. At this time the Birchmeiers began to produce a small typewriter at Pieterlen, near Biel, Switzerland. Georg dates the start of the family which Will Davis labelled the “Euro Portable” from here. 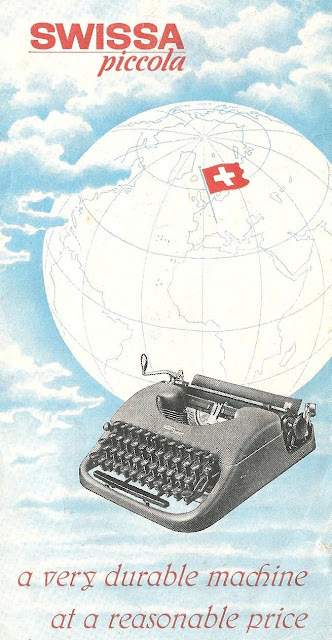 The Swiss Patria typewriter was, Georg says, the original model for a whole range of European-produced machines. These include the Japy, Oliver, Byron, Patria, Amaya and Voss Privat. 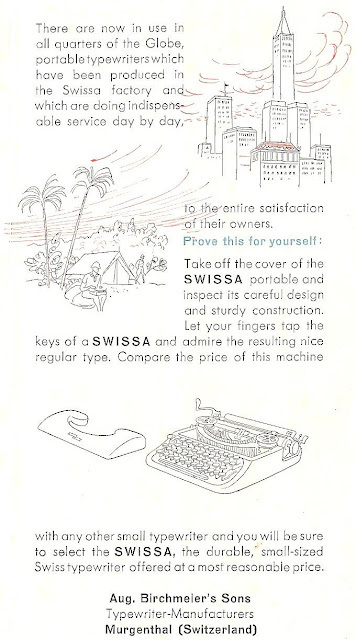 “The small or portable typewriters so far on the market are too heavy for travelling purposes … the known portable typewriters must be carried in a container specifically designed for this purpose … parts [should] be kept so small that [the typewriter] may conveniently be carried in a small travelling bag, portfolio or … a school knapsack or the like ..
“The efforts which have so far been made by manufacturers with a view of constructing portable typewriters have more and more lost sight of the underlying principles that ensure proper portability and in fact have rather followed the opposite way in attempts [to accommodate] the several parts [present in] large office typewriters. “ … the [portable] typewriter has thus essentially lost its value, and its weight as well as its price has been steadily increased; so that the ‘portables’ of the present day [no longer] serve the purpose for which they had originally been intended …"
In 1944, the Birchmeiers acquired a new, stylish outer casing design for what was mechanically the same typewriter. 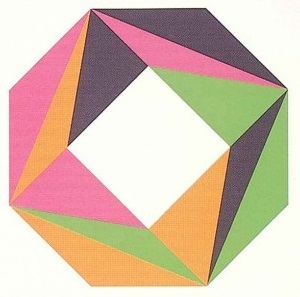 The design came from Max Bill. 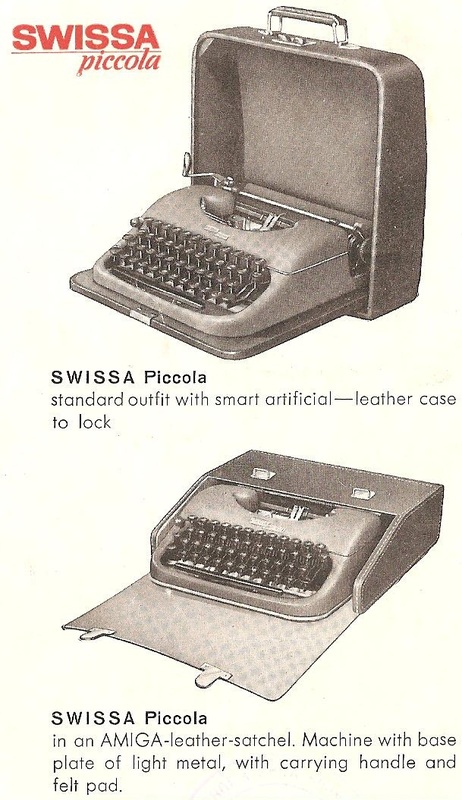 The Bill Swissa Piccola portables were first produced in 1950, and the factory remained operational for another 30 years. Max Bill was born in Winterthur on December 22, 1908, and died during a visit to Berlin on December 9, 1994, just short of his 86th birthday. He served an apprenticeship as a silversmith from 1924-27, then studied at the Bauhaus in Dessau from 1927-29, after which he moved to Zurich. From 1937 onwards he was a prime mover behind the Allianz group of Swiss artists and in 1944, became a professor at the school of arts in Zurich. In 1953, Bill, Inge Aicher-Scholl and Otl Aicher founded the Ulm School of Design in Ulm, Germany, a design school initially created in the tradition of the Bauhaus and which later developed a new design education approach integrating art and science. The school is notable for its inclusion of semiotics as a field of study. The school closed in 1968. Bill was the single most decisive influence on Swiss graphic design, beginning in the 1950s with his theoretical writing and progressive work. His connection to the days of the Modern Movement gave him special authority. As an industrial designer, his work is characterised by a clarity of design and precise proportions. 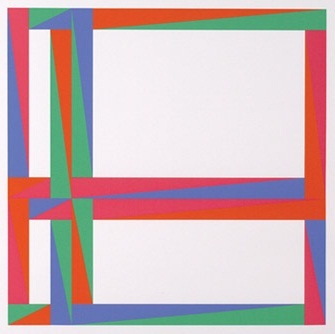 He sought to create objects so that the new science of form could be experienced by the senses. 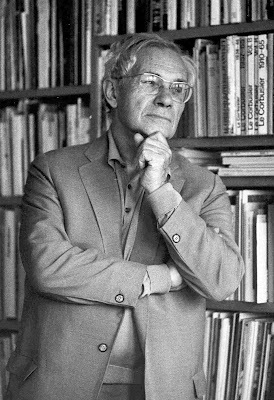 From 1967 to 1971 he became a member of the Swiss National Council, then a professor at the Staatliche Hochschule für Bildende Künste in Hamburg and chair of Environmental Design from 1967-74. In 1973 he became an associate member of the Royal Flemish Academy of Science, Literature and Fine Art in Brussels. In 1976 he became a member of the Berlin Academy of Arts. 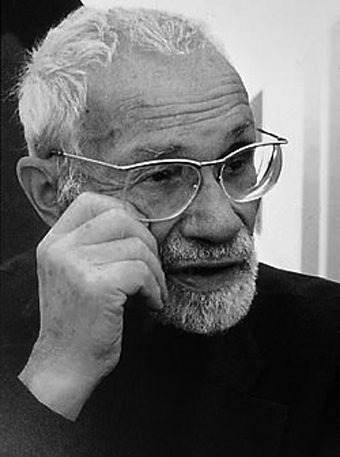 He taught that industrial design is closely linked to social and political responsibility and must not be influenced by considerations of profit. Bill regarded himself as a product designer, entirely in the service of the public. 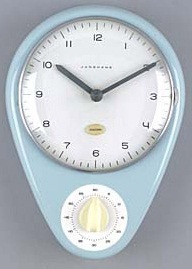 His output ranged from jewellery designs, a shaving brush, a mirror and hairbrush set, a wash stand, the aluminium handle for a piece of kitchen furniture, crockery for Hutschenreuther and the legendary Junghans kitchen clock. As one can see from this image, the clock looks so much better in a pleasant colour. 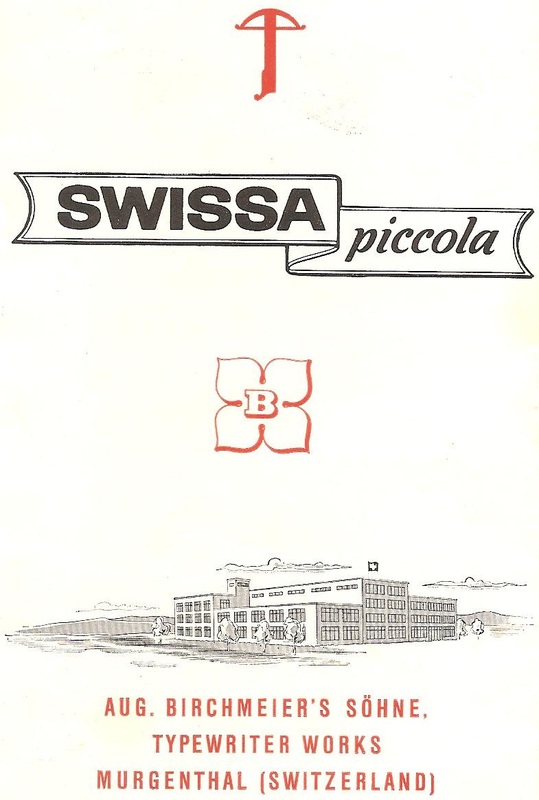 Excellent article, although I have to add that it wasn't the Birchmeier corporation that designed the Swissa Piccola, but it was invented by Otto Haas for the swiss PATRIA corporation, which licensed (?) the production of typewriters (already in the Bill design) to Birchmeier's Sons shortly after World War II. 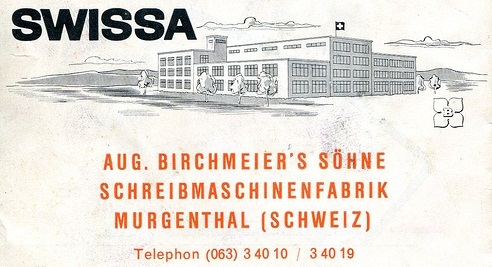 They continued to produce the same typewriters under the new brand name Swissa. Interesting story, and I like the repainted Swissas. I had never heard of the Amiga case/base version. 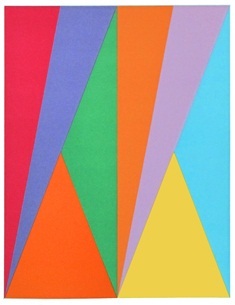 I like the colors. Nice job. Thanks for a very interesting article and all the fine details. PS Very nice paint job! How did you do it? 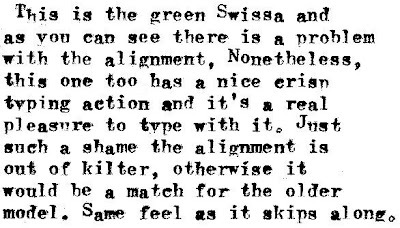 By now, I have knowledge of an original red and green Swissa piccola. Production of this design started in 1945 still under the brand name "Patria", then continued - mechanically unchanged - as "Swissa piccola" from 1950. I keep discovering more variants of this European family, which really should be called a typewriter CLAN.